The California Sister, beautiful, but not tasty. Out in my back yard I saw a butterfly flying low, straight and fast, too fast to identify perfectly. It landed half way up a redwood tree and proceeded to open and close its wings, displaying its striking markings, still too far away to identify perfectly. That's because there are two species of similar size, color and flight habit living here. They're not closely related, but they do look alike. 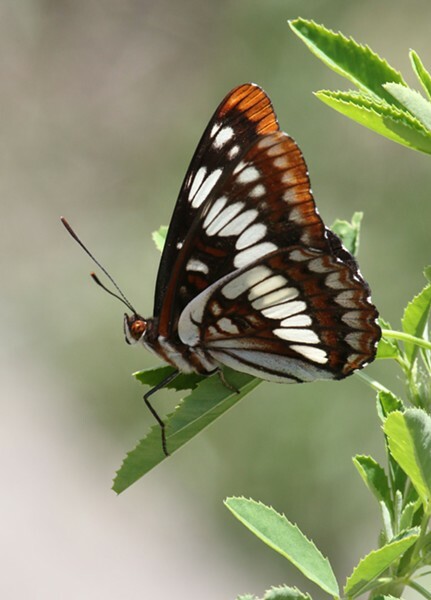 It was either a California Sister (Adelpha californica), or Lorquin's Admiral (Limenitis lorquini). The latter is named for a French naturalist who came to California during the Gold Rush. Together, the pair is an excellent example of the scientific phenomenon known as Batesian mimicry. The Lorquin's Admiral masquerading as someone less palatable. The larvae of the sister feeds almost exclusively on oaks, which makes them unpalatable to predators. The admiral dines on willow, poplar, cherry and other trees. Although I have never actually sampled one, I understand they are edible. In flight, the two species are nearly indistinguishable. The fastest and easiest way I have learned to tell sisters from admirals is by the position of the orange patch at the tips of the front wings. 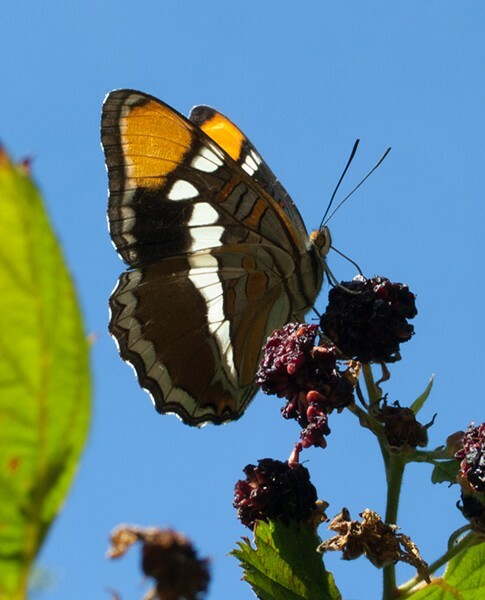 The sister's are bordered by brown, while the orange on the admiral's extends almost to the very edge. Hard to make out at 20 miles per hour or displaying its wings 50 feet up in a tree. I have seen members of both species chase one another. While it might be territoriality (both species are known for this trait), I choose to believe it was a matter of mistaken identity.